This StuART of the puppies is one of my 2014 favs. 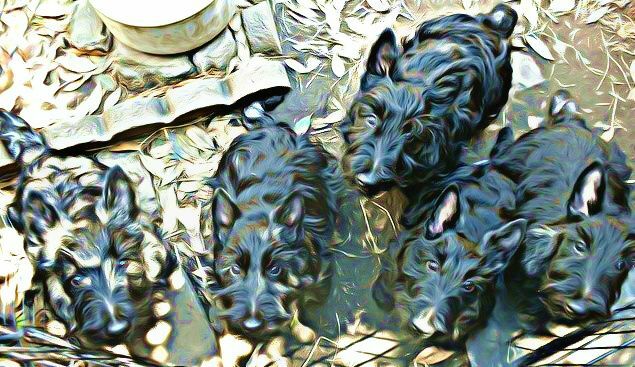 This entry was posted in The Scottie Chronicles and tagged art, dogs, puppies, Scotties, Stuart, watercolors. Bookmark the permalink. Happy New Year Buddy Edgar! You too you guys! Thanks! Y’all have a wonderful new year too HAPPY ARROOO YEAR TO YOU AND YOURS! Have a Happy and Healthy 2015. Happy New Year to you and your peeps, Stuart! Awww, they sure are very cute puppies! Stuart we love all your Stu-Art but we agree this is one of our favorites! Have a great New Year’s Eve tonight! HAPPY NEW YEAR to you and your family. The puppies are adorable. Stuart, that’s cheating. Puppies always make it a good picture. They’ve never made a movie “Godzilla vs. the puppies” because the puppies would steal the show and the Godzilla franchise would be ruined. Well you gots so many its hard to choose…but thats a great one….Have a Happy New Year Stuart to you and the Peeps! Oh we love the puppies!